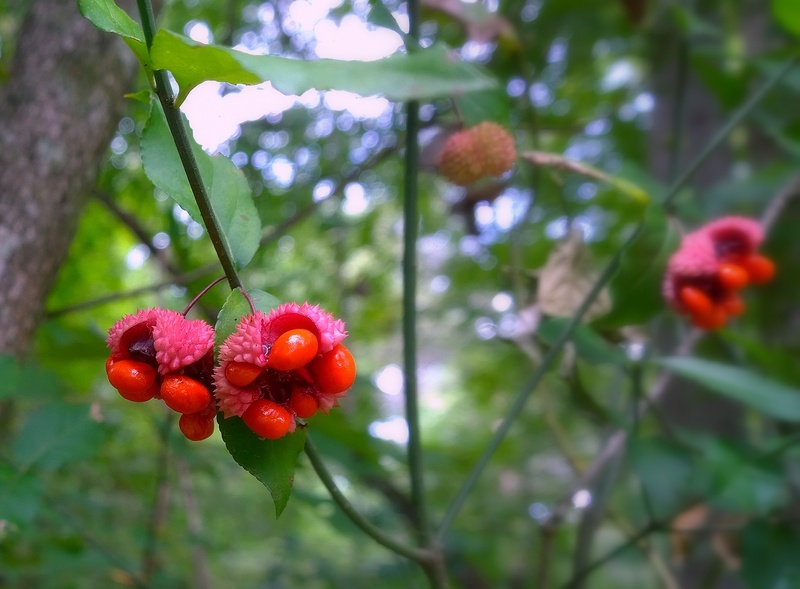 Say hello to Euonymous americana, or American Strawberry Bush / Burstin Hearts / Wahoo. Although, Jane swears it’s called a Cat’s Paw. 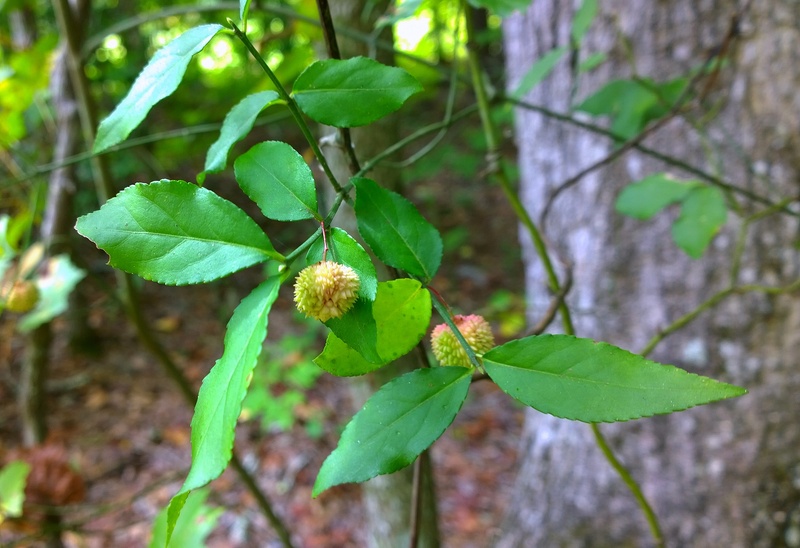 A member of the bittersweet family, the strawberry bush likes to inhabit wetter areas on the edge of wooded groves – or as in my case, the drainage runoff area just off the neighborhood road in the middle of the right-of-way. It’s a wonder I even saw it in the first place. 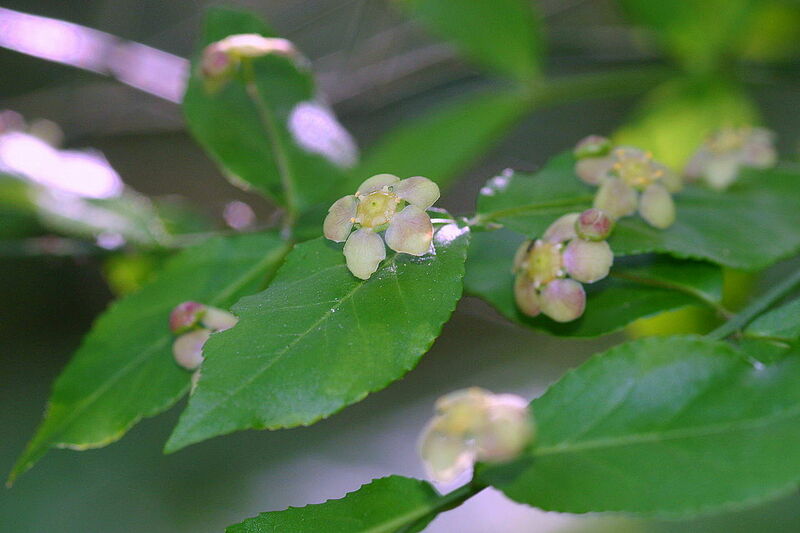 Cultivated and cherished, Euonymous Americana has been an old Southern favorite even though propagating plants from seeds are not always successful. Your best bet is to either purchase a plant from a reputable native plant nursery, or find and transplant one from the wild. 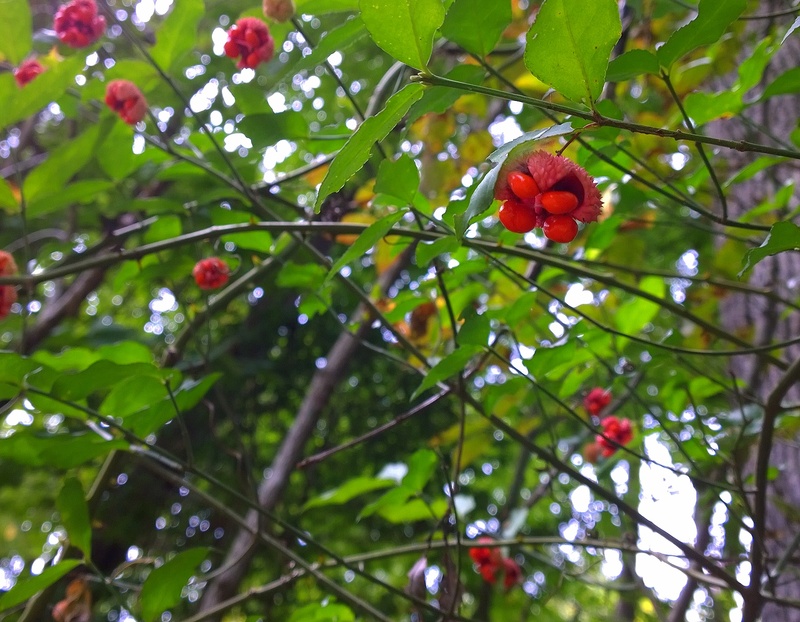 It is a deciduous, loose shrub with wildly branching limbs and bright green leaves. Plants that sit closer to the edge of the wood and receive more light, have branches and leaves with a decided purple tint. Beginning in early September, the seed pod blush a deep red and “burst” open to reveal 4 shockingly bright orange / red seeds. The Inner seed cavities are a vibrant purple. Soil Description: Moist to dry soils. Conditions Comments: Although it will tolerate full shade, strawberry bush fruits best when grown in light shade. Description: Semi-hardwood cuttings taken in fall root readily with no hormone treatment. Increase also by separating suckers. A less reliable method of propagation is by seed. Seed Collection: Pick seeds by hand just before fleshy capsules begin to split. Air-dry on screens. Store in sealed, refrigerated containers. Seed Treatment: Seed must be stratified. Some texts say a single stratification at 32-50 degrees for 90-120 days is appropriate. Others say double stratification is necessary … 90 days warm and 60 days cool. If you want your very own plant – Check out Niche Gardens in North Carolina. Toby, this American Strawberry Bush is gorgeous! I love that first photo of the burst seed pods. The color is amazing! It’s always been one of my favorite wild things in the woods here. Unfortunately, I haven’t been able to successfully transplant one closer to the cottage – yet.